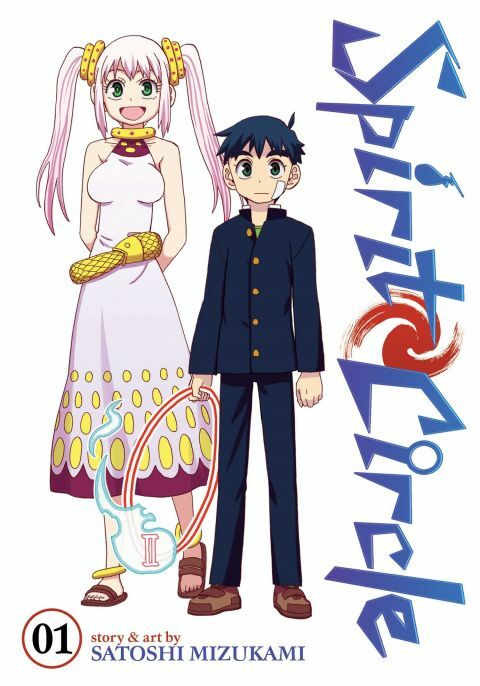 Spirit battles, cultural-spanning reincarnations and mysterious curses abound in this highly-anticipated manga series by acclaimed creator Satoshi Mizukami. Fuuta Okeya can see dead people. Besides that--and the bandage he always keeps on his cheek--he's a perfectly normal 14-yearold boy who thinks the new transfer student is pretty cute. But to his dismay, Kouko Ishigami wants little to do with him. Strangely enough, it's the ghost that follows her around that seems glad to see Fuuta. Just when Fuuta thinks he's won Kouko over, she catches a glimpse of the birthmark beneath the bandages on cheek, and has a change of heart. Not only does she denounce him as her enemy, but she claims that the birthmark is a curse she engraved upon his face during one of the many past lives they shared together. Just what does Kouko have against him--and who is her enigmatic, ghostly shadow? Other products for "Spirit Circle" in "Books"